We were so excited! I've collected glass my entire life, and this is the most I've ever collected in one day! I used a Sony Cybershot G camera for this photo. Try with and without a flash! This picture was taken with a flash even though it wasn't needed. It caught the colors better than natural light did. Always be aware of where your shadow falls. Make sure you're not taking a picture of yourself! "State Park by: Anonymous" said, "Collecting rocks and minerals in State Parks is illegal." Mostly brown, white & green, but for New Hampshire, there's quite a bit. More so during the winter months when the snowbirds are down south! Collecting rocks and minerals in State Parks is illegal. We've been there a few times and have never found a single piece. 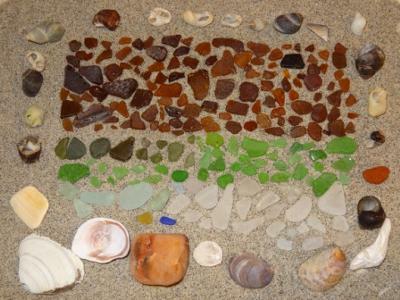 We're avid sea glass hunters here in Maine.